Sell your QUEENSRYCHE items on eBay ! QUEENSRYCHE were one of the most successful metal bands in the 80's. They have sold over 17 million albums through the years. 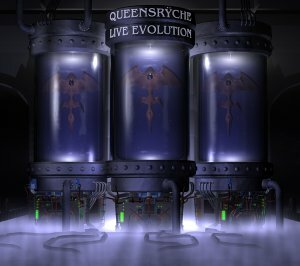 "Live Evolution" was recorded at the Moore Theater in Queensrÿche's hometown Seattle in July 2001. It's QUEENSRYCHE's first live album and it covers their whole career. The songs are divided into four suites. The first CD covers the years 1983- 88 and the second CD the years 1989 up 'til now. The first suite contains eight songs from the first albums "The Warning" (1984) and "Rage For Order" (1986). The second suite contains 10 songs from their best album ever "Operation: Mindcrime" (1988). The third suite contains six songs from the two albums "Empire" (1990) and "Promised Land" (1994). And the last suite contains songs from "Here In The Now Frontier" (1997) and their most recent album "Q2K". The first CD contains some of the best heavy metal songs ever while the second CD is a lot weaker. All in all the performance and the songs doesn't live up to what they once were. I especially miss Chris DeGarmo who was a much better guitarist than Kelly Gray, and Geoff Tate's voice doesn't reach the same heights as before. There were many QUEENSRYCHE fans that lost their interest in the band with the release of "Hear In The Now Frontier" (even if I think it's a great album). This live album won't win them back, and I doubt that QUEENSRYCHE will ever reach the same success as on their heydays in the 80's. QUEENSRYCHE are currently in the studio recording a new studio album that will be released next year. Lets hope for a miracle, because there's many fans out there waiting for a worthy follow-up to "Operation: Mindcrime" and "Empire". Post a review of QUEENSRYCHE "Live Evolution"